Such great new from our friends at St. Martin’s Press — KILLER YEAR, the ultimate anthology of debut authors from the crime fiction class of 2007, has been reissued today in mass market, with a snazzy new cover and some updates inside. And for the first time ever, there is an audio edition! It is so cool to see this little project back in print and better than ever. Grab yours today! 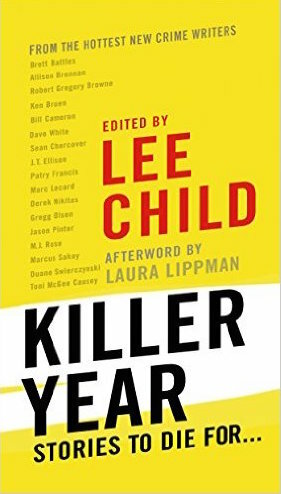 A collection of killer stories from some of today’s hottest crime fiction writers, edited by grandmaster and #1 New York Times bestselling author Lee Child. Killer Year is a group of thirteen authors whose first novels were published in the year 2007. Now, each member of this widely-praised organization has written a story with his or her own unique twist on the world of crime. Each entry in this one-of-a-kind collection is introduced by the author’s Killer Year mentor, including bestselling authors James Rollins, Tess Gerritsen, and Jeffery Deaver. Other contributors—of original stories, essays, and commentary—include acclaimed veterans Ken Bruen, Allison Brennan, Duane Swierczynski, Laura Lippman, and M.J. Rose. This is an book/audiobook that no fan of the genre can do without. Killer Year is a group of 13 debut crime/mystery/suspense authors whose books were first published in 2007. The graduating class included such rising stars as Robert Gregory Browne, Toni McGee Causey, Marcus Sakey, Derek Nikitas, Marc Lecard, JT Ellison, Brett Battles, Jason Pinter, Bill Cameron, Sean Chercover, Patry Francis, Gregg Olsen, and David White. Each of the short stories displaying their talents are introduced by their Killer Year mentors, some of which include bestselling authors Lee Child, Tess Gerritsen and Jeffrey Deaver, with additional stories by Ken Bruen, Allison Brennan and Duane Swierczynski. Bestselling authors Laura Lippman and MJ Rose contribute insightful essays. Inside you’ll read about a small-time crook in over his head, a story told backwards with a heroine not to be messed with, a tale of boys and the trouble they will get into over a girl, and many more stories of the highest caliber in murder, mayhem, and sheer entertainment. This amazing anthology, edited by the grandmaster Lee Child, is sure to garner lots of attention and keep readers coming back for more.